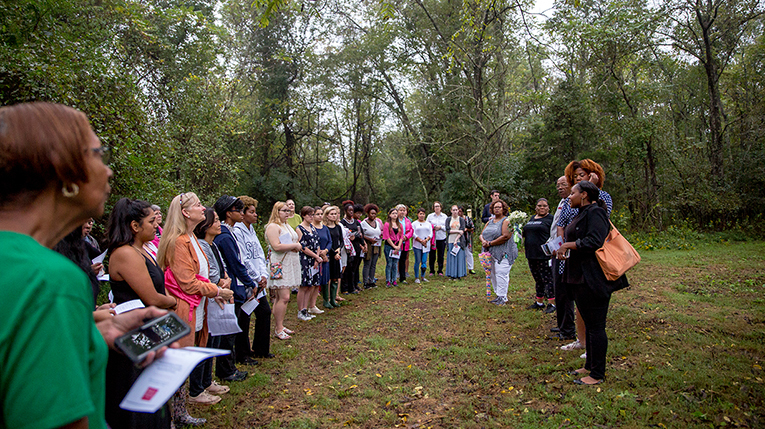 It rained overnight, but the Sweet Briar community began Founders’ Day with a walk to the Sweet Briar Plantation Burial Ground. 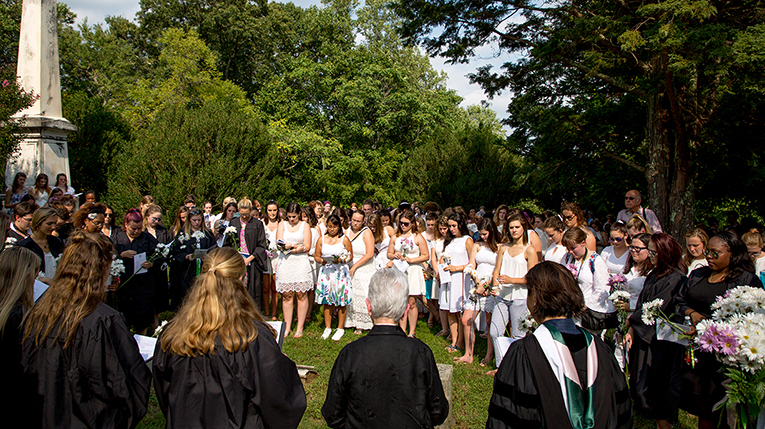 More than 30 people, including some descendants of the people buried there, braved the wet ground and early morning to honor the College’s invisible founders. The moving ceremony featured readings from the Bible, poetry by Maya Angelou and Phillis Wheatley, and some words of wisdom and prayer by Rev. Jasper Fletcher, a descendant of the Fletcher family. Those who gathered there this morning then took some time to pause and reflect. 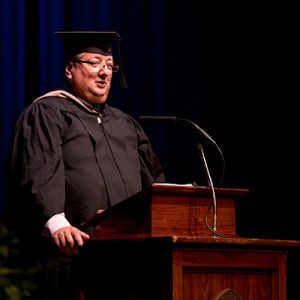 “I speak for the entire Board when I say how very proud we are of you, and how honored each of us feels to be serving on your behalf, and on behalf of Miss Indie, to continue to buildupon the wonderful promise of our beloved College,” he concluded. President Meredith Woo was next to speak and observed that beginning the day at the slave cemetery was a reminder about how long it can take for true justice to come. “Progress is a slow process,” she said. “And all is not well, even today. But we need to keep pressing until the changes are visible. It’s okay to go two steps forward and one step back,” she continued, “as long as it’s not one step forward and two steps back. Woo noted that not all institutions honor and appreciate their history and said that at most of the institutions she attended or worked for, she didn’t think many people gave their founders much thought at all. “Until I got to UVa,” she laughed. “They never stop talking about their founder.” She’s glad to be able to work at Sweet Briar, a place that remembers its history. She also acknowledged that the United States has led the world in many ways, but that this is a time of turbulence and uncertainty. “We have to do some real thinking about how we all can be a meaningful part of history,” she said. She pointed out that Alice Dixon ’82, another member of the board in attendance for Founders’ Day, was on hand to help students, faculty and staff register to vote and encouraged everyone to do so. “Be a part of a great process that is making a difference in the world,” she said. 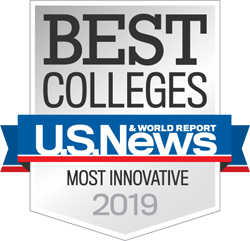 President Woo was followed at the podium by Dean Lynn Rainville, who presented this year’s academic and College awards to students. Following a rendition of “Sweet Briar, Sweet Briar, Flower Fair” by the Sweet Tones, the bagpiper led the group out of Murchison Lane Auditorium and up to Monument Hill. The walk was warm, but water and shade awaited the group at the top as they honored the legacy of the Williams family, where, at the base of the monument are inscribed the words “We kept the faith.” And we still do.